The heavy log mounted between two posts in the bear enclosure is the latest victim. It has joined four other climbing trees, five den boxes and a piece of ceiling in the roofed part of the pen in spelling out an unmistakable message: my yearling bears want out. They are tearing apart everything they can get their paws on. Spruce, my “problem child” for the longest time because of his lack of confidence, looks at me mournfully. The log between the posts was his favourite sleeping spot. Shooing him down so he would mingle more with the other bears was part of our morning routine, me shouting “hop, hop, hop” and waving the rake, he extending his upper lip to the extreme maximum into a very long, unhappy face. Spruce is quite possibly the longest lipped bear in existence. “I’m sorry”, I tell him. Sorry that he who could never hang on to a den box now lost even this awkward sleeping spot, sorry that I won’t get “the lip” anymore, sorry that soon these thirteen bears will only be memories for me. And I’m sorry they will still have to wait a few more days until their releases back into the wild begin. They have grown in size and confidence, are so clearly ready to go. Just how ready these bears are to be returned to the wild when it comes to exposure to other humans was brought home to me just recently. Though it wasn’t my personal achievement, nothing made me prouder of my bears than seeing how they react to a strange person. The vet and his assistant came to give the approval for Huck, a bear who had been very sick in October and who has since fully recovered, to be released. As soon as the bears heard the unfamiliar voices, their noses went up to catch a whiff of these strange humans. 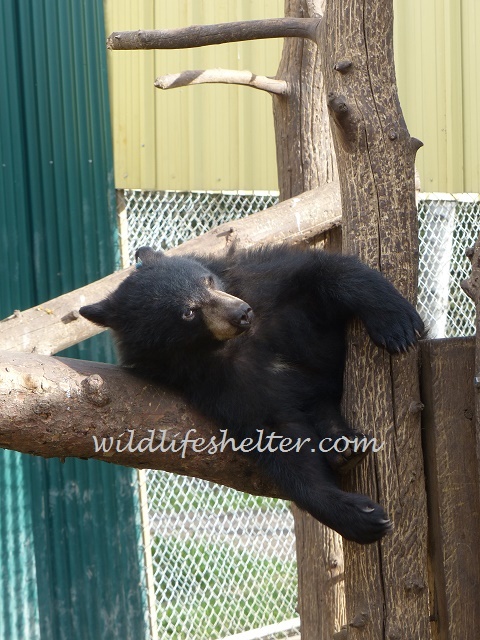 In stark contrast to how they ignore the presence of me and my co-volunteer Brooke and just keep going about their business, all thirteen cubs fled up the climbing trees, huffing nervously, when the vet and his assistant approached the fence. Not a single bear wandered over to check them out. They all kept their distance. I had heard from NLWS’s founders Peter and Angelika Langen that this would be how the bears react to strangers, but seeing it in action – witnessing how hard my cubs try to avoid people they don’t know – gave me goosebumps. The bears showed the same reaction when the camera team that is filming the second season of “Wild Bear Rescue” about the shelter arrived. I feel extremely confident that these cubs will show no inclination to approach humans once they have been released. The behaviour of the bears is due to the fact that at Northern Lights Wildlife Shelter, they are being cared for by the same two or three people during their long months at the shelter. Exposure to other humans is limited to an extremely small number and kept strictly neutral (no positive experience such as getting fed) or negative (getting caught for a health check or transport). Because of this, the bears learn there is nothing to be gained from humans. Spruce, bereft of his old perch, sits on his haunches, massaging his right front paw with the left one as he often does while watching me and my co-volunteer Brooke rake up the piles of poop. I wish I could tell him and the other bears that soon, they’ll be released into the lives they were meant to live where every day will be a new adventure. And I wish I could let them know how grateful I am for the incredible insights they’ve given me into bear behaviour.